U.S. Flag (48 stars) with 1 or more gold stars (but never all of them) in place of the correct white stars. I have seen 1, 2, and 4 gold stars, usually the first few in the top row at the hoist. 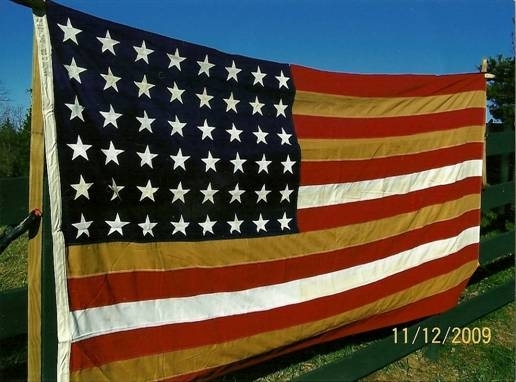 Howie Madaus reported in 2001 that he had heard of a flag where two rows of stars on a 48 star flag were gold and the rest white. U.S. Flag (48 Stars) with 1 or more gold stripes (but never all of them) in place of the correct red stripes. I have seen gold stripes #3, #5, #9, and #11 (counting from the top). Jim Ferrigan, Howie Madaus, and I discussed this at some length. We rejected the notion that some kind of substandard fabrics were used which aged to a bright golden color. Although this is possible with certain cotton fabrics, it seems too regular to not have been deliberate. At least one of the flags I have seen is in like new condition, having been carefully stored since 1918. We have not completely ruled out substandard fabrics, however. There seems to be a European connection on all of these flags that we had such data on. While not all of the flags in this category are identified as to origination, those that were identified this way were all European in manufacture (and all were from France). Dating has been difficult on these flags because of the similarities of manufacture from World War I to World War II, although all those I have seen with any kind of a story place the flag in World War I. Only one flag I have seen was without question from 1918 and it has 4 gold stripes replacing #3, #5, #9, and #11 (counting from the top). However, it was not a military funeral flag and, in fact, bore markings that indicate U.S. manufacture although the owner who inherited it has documents that clearly state it originated in France. Who knows? I have searched U.S. sources from 1916-1918 and from 1940-1945 and have turned up nothing about such flags. Maybe someone in France or other parts of Europe may have better luck. The jury is still out on this. Regarding casket flags, this is a custom whose origin seems to be at least several centuries old. It may have originated in the naval custom of covering a casket with the ship's ensign when conducting a burial at sea prior to sliding the casket overboard (but retaining the flag). The U.S. Military has more or less used this custom since the Civil War (seems to have been just used for officers on occasion at that point) but it wasn't codified into military rules until World War I or thereabouts, as far as I have been able to determine. Today, such flags are usually 5 by 8 feet in size (1.5 x 2.4 meters) although the official size is supposed to be 5 x 9.5 (1.5 x 2.9 meters). The flag is used during the funeral to cover the casket, then folded into a triangle and presented to the next of kin with appropriate words. NAVA NEWS #190 (April-June 2006) featured a cartoon on the back cover that details the flag ceremony at a military funeral. Based on comments received from inquirers to the FOTW website over the past ten years, and confirmation of their existence by Whitney Smith, flags with gold stars were definitely used for caskets of servicemen who died in action in Europe toward the end of World War II or shortly thereafter - it seems to have been a short lived phenomenon, and that only for bodies returned from southern Germany, as I recall (but that was the American zone). As for the reported use of gold stripes on casket flags, this seems to be a recent development. My friends at Humphrys Flag Company in Philadelphia directed me to a comment they found on the "USA-flag-site.org" website about the use of gold stars and stripes: "A lady described to me a flag presented to her Mother in honor of her Father's death on the Bataan Death March. The flag has 5 gold stars randomly spread among the other 43 white stars. In researching the meaning of the gold stars for her, I came across a blog that stated that many American flags, used for military funerals during World War II, were made in France. 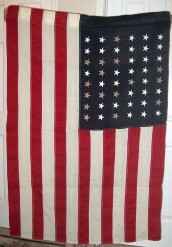 These flags were hand stitched and many included varying numbers of gold stars mixed with the white stars. One man stated that he had a flag with 38 gold stars and 10 white stars. With the situation as it was in the United States and Europe at the time, quality control was not a big issue. One explanation of the gold stars was perhaps the French workers were aware of the Gold Star Mother's flag and added the gold stars as a similar honor. If anyone can verify, add to or deny this explanation, it would be appreciated." The Navy Department Library does not have any information on the subject of gold stripes on U.S. casket flags. However, the U.S. Army produced gold-star flags in the 48-star pattern as part of the ´Plan for Repatriation of the Dead of World War II´ (see the bibliography here: www.ibiblio.org), in which survivors of dead servicemen buried overseas could 'opt in' and have their relative's remains returned to the United States for re-interment in a National Cemetery. It is possible that the gold-striped flags could have been part of this program, or a related program. The matter of gold stars on casket flags came up during my time at the Smithsonian. In a telephone conversation with Whitney Smith I speculated that when the bodies of the dead servicemen were being returned starting, I believe, about 1948, the Army may have decided to contract out the making of casket flags rather than ship them from the US. Such would be in keeping with the goals of the Marshall Plan in Europe to stimulate recovery of war torn countries such as France. If so, local flag makers would have been familiar with the U.S. organization called Gold Star Mothers, established after World War I. They may also have been familiar with the practice of some American families who lost a son to display a service flag with a gold star in the window of a house. Many cities also displayed blue bunting banners with a star for every serviceman from that community. If that man or woman was killed or died in service, a gold star would be placed on the banner to honor the fallen service man or woman. (I presume that it was also done for the women in the various services, although I have no direct proof of the same.) The point is that whether the casket flags were made in France, Belgium, or Great Britain, or for the Pacific Theatre in the Philippines or Hawaii, there would have been direct knowledge of, and probable contact with members of the Gold Star Mothers. In Europe dating back to the post World War I era and in Hawaii and the Philippines after World War II. IT SEEMS PROBABLE that if local contractors made the casket flags for the dead of World War II, they MAY have sewn the gold stars with that idea in mind. I offered my opinion that this COULD have happened and Whitney misunderstood me and it became the definitive answer. The quotation that you sent exaggerates the idea even more. The only way that we may find out is if someone does a search of the Army and Navy records on the return of the war dead. Nobody thought to raise this issue when the people involved were still around. In my Smithsonian days I knew about an exhibit of some casket flags sponsored by the American Legion and written up in the magazine of that organization. Some of the casket flags given to various families had been unrolled and people were curious that while many stars were the traditional ones, there were some that had a few gold stars. Later, from another source, I saw a photo of one that has 48 gold stars. There was speculation about the use of a few gold stars. One idea was that in the factory where these flags were made there may have been containers with both white and gold stars and that in the course of sewing the stars the sewer reached by mistake into the gold box instead of the white. Again this was all speculation. No one knows. It might be interesting to make an inventory of World War II casket flags from the European and Pacific theatres to see how often some or all gold stars were used and whether this practice extended to the Korean War. So there you have it. Much speculation and few facts. I have been engaged in a series of email shots with James Allen Knechtmann, Reference Librarian, Navy Department Library, Naval History and Heritage Command. He keeps referring me to the bibliography he cited, not to the publication "Plan for Repatriation of the Dead of World War II" and he does not seem to understand I found a digital copy of it online and could find no reference in it to flags of any kind. Jim Ferrigan also perused it and came up with the same conclusion, no mention of flags of any kind. I am still rattling Mr. Knechtmann about his source for the citation, but I think this is rapidly going no where. I am more than ever being convinced the "gold stars in the 48 star flag" along with the "gold stripes on the flag" legends are just fabric failures, pure and simple. Otherwise there would be some documentary evidence of it from the period of use, either a short blurb in the newspapers or some obscure regulation in the military or something! So far, nothing has turned up. My mind is still open but not as much as it once was. I received this query about a casket flag. He seems to have ruled out fading as an explanation. Is there another? He said "I have a flag I received at my uncle's funeral in 1955. The 48-star flag that was placed on his casket... has several gold stripes where the white stripes should be. The first, second, fourth, and sixth white stripes are all gold, while the third and fifth are white." Since I'm no good at visualizing, I created this UFE by coloring in a 48-star flag. This only leaves two stripes white, which are not the outer stripes. If this colouring was about those two stripes, those would have been gold instead. Or if specifically about white stripes, then the other stripes would have been grey, rather than gold. So, it must be about the gold stripes. But if it would be about four gold stripes, then the best way to distribute them would be with the white stripes on the outside. In this case, the white stripes divide the gold into three bands with roughly the same amount of gold. If we interpret this as a military custom related to rank; do we have a rank that is symbolised by three gold bands? "I have a large 48 star flag the size given at funerals when a serviceman dies. The first stripe below the stars is gold rather than white like the rest. What does this signify? Is this a veteran killed in the war? Thanks, Judy." Yet another inquiry concerning gold stripes on the U.S. flag. Is there really anything to this? Do the gold or white stripes represent a serviceman's military rank. Is there an organization that would have been responsible for such flags in the period of 48 stars? To help with visualization, I made a speculative version of the flag with one with a single gold stripe. "As the fifteen-year resident flag 'guru' here at National Headquarters, this is the first time we have ever been asked this question! From time to time we will receive a question about 48-star flags with gold stars. Have you made contact with Dr. Whitney Smith? He is THE FLAG GURU and might be able to offer some insight. If you do come across something would you mind sharing it with us?" Assistant Director, Americanism and Children & Youth Division. For a number of years, the U.S. Veterans' Administration, and before that the Defense, and earlier, War and Navy, Departments have more or less supervised the business of casket flags for service personnel and veterans. Today, and for as long as most of us recall, the VA in fact buys, specifies and supplies the 5 x 9.5 foot flags that are used for this purpose. So I should think that a query to the VA, perhaps directed at their archives or historic office, might answer the question of the gold stripes. Including a photo or gif would probably help, if such a thing is available. A 48-star flag would date back 50 years at least, but not more than 98 years; that would mean that the War Department may have been in charge. Those people keep fairly good historical records, so a query there might eventually yield some sort of a reliable reply. Much as I respect and salute the various non-governmental veteran´s organizations -- VFW, American Legion, DAR, etc. - they are not the real arbiters of this question, and I doubt that they have definitive resources to respond. I have a suspicion, as Al Kirsch probably does too, that there is a very interesting story lurking behind this incident someplace, if only we can find it. My last inquiry about an Annin manufactured flag (UFE10-8) resulted in failure because apparently they only keep records for the last five years, but I still feel there is a story behind these gold striped flags, so I plan to ask them if they know anything about gold striped 48-star flags or the traditions behind them. "This is the first time I have come across any U.S. Flag with anything other than red and white stripes. For that reason, we have no protocols for such a flag and would not consider it a proper burial Flag. Over the past few years I've had a number of flags brought to my attention that have similar characteristics, they appear to be standard 48-star U.S. flags except that there are stripes of yellow that appear on some part of the flag. These presumably were done intentionally, but most of the men involved have died and their relatives now hope to find out what the meaning is - too late. There probably was some kind of symbolism having to do with the individual or military circumstances that is now lost. I wish I could help you on this but military and government authorities I have contacted don't seem to know either. I have some images of actual flags and will eventually pull them together to form an article in The Flag Bulletin which should at least give a better idea of the intentions of the makers. UFE Editors Note: The following organizations were contacted and responded, but were unable to help. : Veterans of Foreign Wars, Annin Flag Company, American Legion, and the Veteran's Administration.
" I believe each stripe represents a particular amount of World War II deceased personnel. I will check, but I think each gold stripe stands for 50000. It was idea that arose from the U.S. Army Quartermaster Depot in Philadelphia where the flags were made to denote with a special gold stripe a fallen hero. It didn't matter what rank and it may have helped keep track of how many flags were being made too. Let me do some more research and I will get back to you." " I was not able to find anything official either heraldic or graves registration wise. I checked all the QM Depot flag photos we have and all the articles on flag manufacturing we have. I do remember an article on the Internet ten years ago that reported seeing at least one gold striped flag on a railroad siding, with many other flagged caskets being transported, and I remember being told the stripe designated the 50000th dead service member. We did locate in the QM Depot records several notes suggesting that it was an idea of either Col. George Christie, Jr., head of manufacturing Division QM Depot, or Mrs. Helen Martin, Chief of the QM Flag Section. During World War II and for 30 years after, Helen was known as the Betsy Ross of the flag Section. So I definitely think it was an internal idea as there are no official plans for these flags with gold stripes to be manufactured. They were a symbolic way to honor the war dead and a way to inventory the flags at the same time. I will keep looking for supporting documentation." We are researching the significance of the 48-Star flags with gold stripes and will send a complete response soon. Could the gold-stripe idea (and the gold stars in the 48-star canton) have been suggested by the Gold-Star Service Flag which was introduced in World War I? New Enquiry forwarded by Rob Raeside: "A friend has a flag that has been in their family that has red and white stripes along with gold stripes and 48 stars. What is the name of this flag and what year did it come out? Here is a picture of the flag. - Pat, 6 July 2010." Would this be a coffin flag, like the other two? Either, does the friend's family know that it was used for the funeral of a relative, or is it something like 1.5m x 2.9m (5' x 9.5') in size, as Al Kirsch describes it? This is the same pattern as the flag the nephew of a service man asked about, mentioned on our page. I hope Pat can determine whether we're really talking about a new case here, or whether by coincidence this is the same specimen, that is being asked about for a second time. Judy's flag was stamped "Annin," for Annin flags. I can't quite make out the mark on Pat's photograph. I'd say "Annin" might fit, but hopefully Pat can tell us for sure what is written at the hoist. Originally, I had understood the explanation from Luther Hanson to refer to different flags honouring each subsequent 50,000th death, as that would explain the patterns. But if two of them are the same, the system, if it existed, must have been different.